After being involved in an accident when riding my motorbike, my insurance company referred my claim for personal injury compensation to a firm of solicitors. However, every time I called this firm, I had to speak to a different person and would find myself explaining what had happened all over again. The final straw came when I spoke to someone who clearly had very little knowledge of motorcycling and I seriously considered giving up, even though I’d not been to blame for the accident. I was riding along a straight road on my motorbike, a Honda VTR 1000 Firestorm, when I approached a set of traffic lights, which were at green. As I went through the lights, the car travelling in the opposite direction turned right - and into my bike. My bike was written off, my bike gear was damaged and I was really battered and bruised. I was off work for a week, although I went back sooner than I should as I’d only just started a new job. I definitely deserved compensation but it was all becoming incredibly stressful. Then a friend mentioned that he knew a good lawyer who specialised in motorcycle accidents – Brenda Mitchell of Motorcycle Law Scotland. After talking to Brenda, I asked if it would be possible for her to handle my case as my insurance company had referred me to another legal firm. Brenda explained that I didn’t have to use the legal representatives provided by my insurance company. 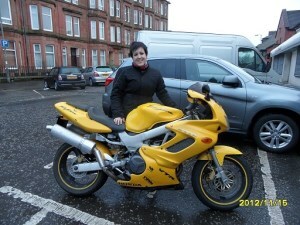 All I had to do was give her the go-ahead and she would arrange for my case to be moved to Motorcycle Law Scotland. From then on, my compensation claim was hassle-free. Brenda was highly professional, kept me informed throughout the process and, as she’s a motorcyclist, knew exactly what I was talking about. I had every confidence in the service provided by the Motorcycle Law Scotland team and, a month ago, received a cheque for £4,000, which is I feel is fair compensation for loss of work, my damaged bike gear and my injuries. The service provided by Brenda was totally flawless. I can’t praise Brenda and the Motorcycle Law Scotland team enough.